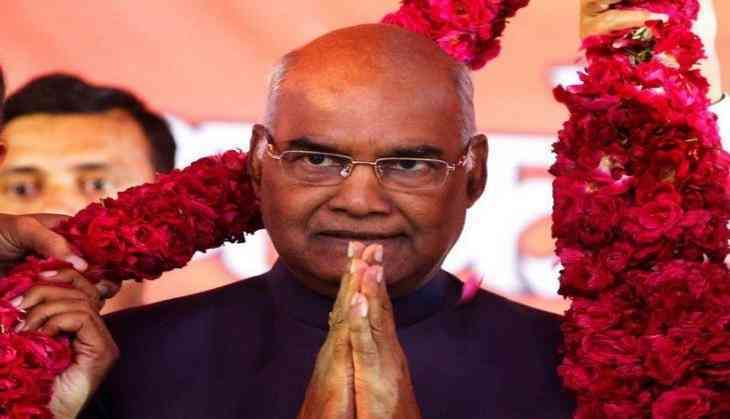 Union Minister for Urban Development Narendra Singh Tomar said that Ram Nath Kovind was elected as the President of the country and should not be seen as the face of the Dalit community only. "Ram Nath Kovind was elected as the President of the country and he should not be seen as a Dalit face now," Tomar said in an exclusive interview with Zee Regional Channels' CEO Jagdeesh Chandra. Bahujan Samaj Party (BSP) supremo Mayawati was elated with the fact that both the nominees for the 14th President of India were from the Dalit community. Ram Nath Kovind swore in as the 14th President of India on Tuesday at Rashtrapati Bhawan in a glittering ceremony. Kovind was administered the oath of office and secrecy by Chief Justice of India J S Khehar. He exchanged seats with Pranab Mukherjee and a 21-gun salute followed as the new President Kovind made his first address. Kovind was elected the President as a ruling NDA candidate. He defeated the Opposition parties' nominee Meira Kumar by a huge margin. Kovind obtained 65.65 percent of votes from the electoral college, while his opponent, Kumar secured 34.35 percent. Kovind secured 2930 votes with a value of 7,02,044. Kumar got 1,844 votes with the value of 3,67,314, said Anoop Mishra, the returning officer for the presidential election 2017.